TuSimple, a Chinese startup building autonomous truck technology, is on a mission to disrupt fleet operators all over the world. The firm is following a different road than others developing self-driving truck technology. Most developers of self-driving truck technology see themselves selling systems up to entire vehicles to motor carriers and fleet operators. TuSimple, however, plans to operate its own fleet of long-haul trucks without human drivers. A manufacturer will build the trucks, but TuSimple will supply the autonomous technology and manage the fleet. For example, in China, TuSimple has a partnership with Shaanxi Automobile Group to manufacture trucks equipped with its self-driving technology. It then has a deal to use the vehicles to ship goods for JD.com, a Chinese motor carrier. TuSimple said it is close to signing a U.S. manufacturer to build trucks equipped with its technology. “Just like buying a computer with a ‘VR ready’ label on it, these autonomous trucks are just trucks, but with ‘TuSimple ready’ labels on it,” Xiaodi Hou, TuSimple’s co-founder and chief technology officer, told Trucks.com. Getting rid of the driver is key, Hou said. Otherwise the savings that fleet managers would achieve by making the switch to autonomous trucks would not be significant enough to warrant the investment if the driver is still a factor. But once the cost of drivers is eliminated, fleet operators would be motivated to quickly adopt the technology, Hou said. The American Trucking Associations estimates labor costs including driver pay equal about 40 percent of truck-load carriers’ annual revenue and 60 percent to 65 percent of revenue for less-than-truckload, or LTL, carriers. Also, trucker wages in the U.S. are rising. Research conducted by the American Transportation Research Institute, or ATRI, showed that in 2015 the average truck driver pay per mile was 49.9 cents, an 8 percent increase over the 46.2 cents reported in 2014. Jobs site Glassdoor published a report in August showing that over the past 12 months, median annual base pay jumped 5.7 percent, to $52,079. TuSimple does plan to use drivers in the early stages of development. “A driver will operate the vehicle whenever needed,” Hou said. The company plans to work closely with legislators to prove the vehicle’s ability without a driver, however. When the time is right, it will operate in a fully autonomous mode, he said. But not all players in the autonomous space think self-driving trucks should ditch the driver. Uber, which acquired self-driving startup Otto last year, sees its technology as complementary to drivers. “We have a much more optimistic view about the implications for driver livelihoods, employment and productivity due to some of the ways we see the industry shifting with the technology,” said Alden Woodrow, product lead for self-driving trucks with the Uber Advanced Technologies Group, at the Automated Vehicles Symposium in San Francisco in July. From a technological standpoint, TuSimple could be ready to deploy its technology by 2020, Hou said. But he does concede it’s a giant leap. The second deadline involves other autonomous car and truck developers. If any one of those companies builds a vehicle that causes a bad accident, it could hurt TuSimple’s progress, he said. “If they fail before we succeed, that is another deadly blow to us,” he said. TuSimple, which has offices in Beijing and San Diego, recently raised more than $20 million in a Series B financing round led by Sina, a Chinese social media company. The firm will use the investment to beef up its R&D efforts and acquire new trucks. “There’s a very significant boom in [the autonomous] area as people expect it to be the next great technological innovation that really drives a lot of new investments,” Michael Ramsey, an automotive analyst with Gartner, told Trucks.com. Semiconductor giant Nvidia, one of the biggest developers of automotive technology, is a TuSimple investor, contributing to the Series B financing. “I think that Nvidia is trying really hard to support the companies that are relying heavily on its technology. It’s kind of a virtuous cycle for them,” Ramsey said. 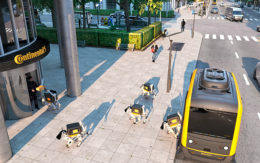 TuSimple used a number of Nvidia products, including a platform for AI computing and a scalable supercomputer for autonomous driving, to develop a driverless solution. Now the company will have early access to Nvidia’s newest technology, Hou said. “The fact that TuSimple was chosen isn’t groundbreaking, but it is an interesting step,” Mark Boyadjis, an automotive analyst with IHS Markit, told Trucks.com. 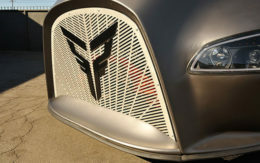 Nvidia, a frequent investor in startups, previously unveiled its plans for autonomous truck development, including a partnership with Paccar in which the two companies will collaborate on artificial intelligence as well as a platform for driverless trucks. TuSimple opened a garage in Tucson, Ariz., and will use the city as a starting point to conduct road tests to Phoenix and back. For its Arizona tests, TuSimple will outfit trucks made by a yet-to-be named U.S. manufacturer, Hou said. The company successfully road tested vehicles equipped with its technology in China’s Caofeidian District. The Shaanxi-built trucks were retrofitted with an array of 13 cameras. “We plan to have a truck with Level 4 autonomous driving functionality to be road tested regularly by the end of the year,” Hou said. A Level 4 vehicle can drive itself with almost no intervention, according to National Highway Traffic Safety Administration guidelines. TuSimple uses cameras and a computer vision algorithm to see objects from more than 200 meters away. Most competitors employ LiDAR as their primary sensor for driverless applications. LiDAR uses laser beams all around a vehicle to visualize the road and detect objects, but the technology’s range is roughly half that of the cameras used by TuSimple. LiDAR sensors manufacturer Velodyne LiDAR Inc. for example, offers products with a maximum range of 120 meters. Still, TuSimple has encountered a number of issues with its technology, including desert heat-induced computer failure, loss of GPS connection and cameras obstructed by smashed insect guts. Hou said TuSimple’s trucks would have a system in place for cleaning bugs and that the company has overcome the other technical obstacles. A bunch of fools and there money will soon be parted. This will never work. There are too many details to driving a truck that cannot be performed by a computer. Winter time will reek havoc with autonomous trucks as it will not be able to adapt to changing road conditions on a mile to mile basis. Gridlock will become the norm as these trucks inch along in the name of saftey as other motorists drive with pure abandon around them. If a driver is needed to babysit these trucks there will be no cost savings as the driver will still have to be compensated well for being gone from their families plus the added cost of the truck. If no driver is required then who will move the truck because of a temporary road closures that is not programmed ints it’s navigation and the truck is parked at a barricade waiting for it to move or can’t make a corner in town because of an illegaly parked car.. gridlock. FOOLS that have never driven a truck.